I’ve used the Codeplex SSIS Dimension Merge SCD component in 2005 and this performed very weel – compared with the Microsoft out-of-the-box offering. 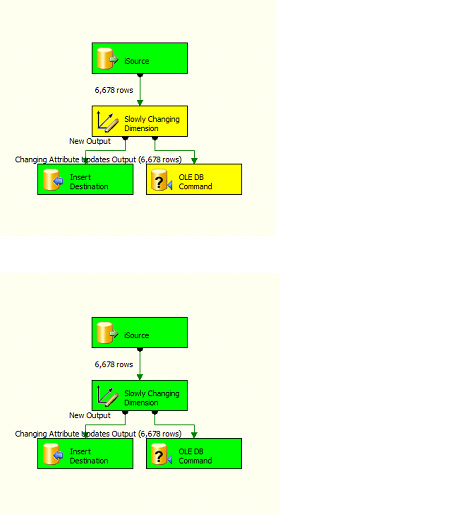 Unfortunately, there is a maintenance overhead if your adding new attributes or dimensions. Now in 2008, the MERGE statement has to be the best option – especially if you tie it into a stored procedure into which you pass dimension information so that you can us to generate dynamic MERGE statements. I’m gonna take a look at that component on Codeplex and see how that compares. Phil, I downloaded that component and setup the same test and the output is far quicker than the standard SCD component but still exceptionally slow in comparison to the Merge Statement. The Codeplex component took 14 seconds which is far better than the 37 seconds for the Standard SCD but no where near as good as the 125ms for the Merge statement. Hi Chris, Yep, I’d agree – if the MERGE statement is available to you (i.e. 2008 on) use it in favour of any components. As I say, by incorporating it into a dynamic statement, perfromance is increased and maintenance is much reduced…..
SCD transformation is slow, I won’t argue there. 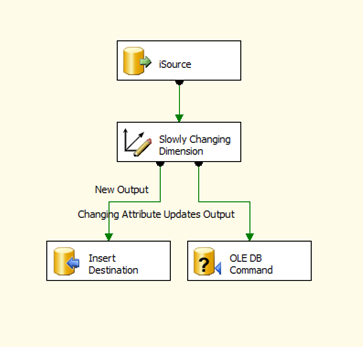 Build-in SCD IS FAST … This was my “shocker” at my SSIS Webinar I did last Thursday. 250k input rows in 200k dimension took 90 seconds on a standard laptop… without extra optimization … with optimization 30 seconds. It’s be interesting to see your results for a similar test using the merge statement as a comparison…..feel free to report your results back here, I’d be very keen to see them! I’ve been discussing that with SSISJoost (MSDN Forum / Twitter) and he will perform comparison between Optimized Build-in SCD and T-SQL Merge. I’ll let you know the results once I get them but I presume difference in seconds will be very small for most SCD loads so that will give two good options for SSIS Developers.